This is a beautiful property that was designed by an architect. The house is close to the town of Mauron. The property has charming private gardens, a large stone garage, three bedrooms, two bathrooms, a beautiful large living room, a dining room, a modern kitchen, a veranda and on the top floor an incredible mezzanine space. The house has been designed to a very high standard. Located in a welcoming hamlet close to the popular town of Mauron you will find this truly unique property. No expense has been spared on this detached property. 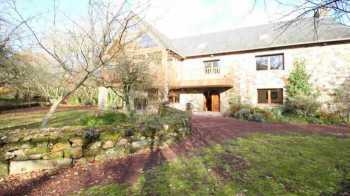 Set in private gated grounds (3730m2) this house will not disappoint. Offering a mixture of contemporary and traditional design this house offers the comforts of modern living combined with the charm of a traditional French stone property. The finishes on this property are of the highest standard, the quality speaks for itself. Entering through the main gates you arrive in the private gardens, to the rear of the property you have a substantial double stone garage with additional space above. To the side of the property you have a covered terraced area. Entering through the main door you arrive in the large bright entrance hall with the double staircase and stained glass window facing. On the ground floor you have a large bedroom with ensuite bathroom, a further two bedrooms with bathroom and separate WC. Also on the ground floor you will find ample storage space. as the bedrooms are on the ground floor this property is fully accessible for those with mobility problems. On the first floor you have the most beautiful large bright lounge / dining area, kitchen with it's own dining area and the most beautiful glass covered veranda area which sweeps around the building. Accessing the second floor via the hardwood staircase you arrive in the most spacious and beautiful loft area, this room would lend itself to the most fantastic family room or playroom or perhaps you need generous office and conference space, this house offers it all. If you are looking for a unique property that is in truly walk in condition, a house that offers you modern living but traditional charm, if you need generous office and working space or want to offer your children or grandchildren the most amazing playroom then this is the house you should visit. Mauron is a popular town. It boasts a number of amenities and shops and benefits from a lovely weekly market. Close by are the popular towns of Josselin and Ploërmel and as a town it is so well situated for exploring the north and south coasts and transport links to airport and seaports are easily accessible.